This daybed started out as a wood bed and I cut out the trees and painted them. 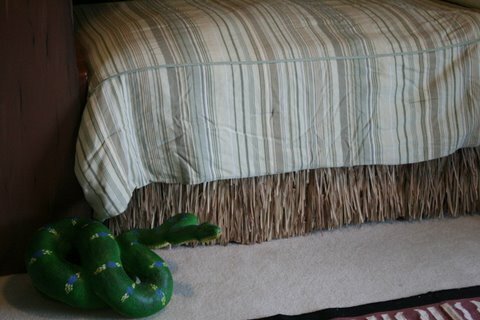 The rug was a simple aztec design that we already had and worked well in room. My husband designed a way to structurally and safely mount them to the daybed and the structures on inside are painted like a spotted giraffe. It makes the experience of crawling into bed for a child, like crawling into the trees to sleep. I painted trees on the wall behind to enhance the feeling. I designed this for my son who was turning 2 and going from a crib to a bed. Had to make it exciting so he would not be tempted to leave his bed at night. Window Valance made with real thatching and mounted on wooden valance cut out and put together to fit outside window trim. Burlap drape used to give it more of a jungle feel. Used giraffe puppets for tiebacks on either side of window. Also made the cubbies in three sections so they are moveable and repositionable and painted in colors of jungle room. Bedskirt I made with leftover thatching from window valance. 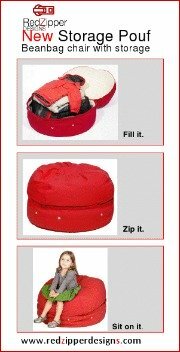 Hides the trundle twin underneath that easily pulls out to make two twins (for sleepovers with friends) or a king (when company visits). This was a card display we were going to throw away. Ends were open and ugly. Had idea that children can't really see books if in a bookshelf with spines only showing. 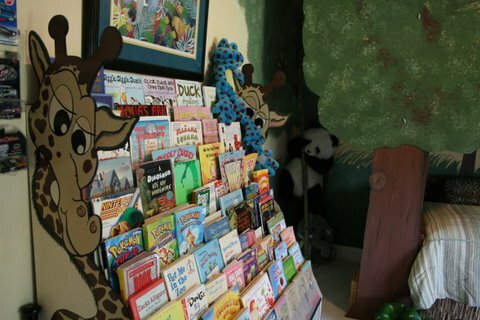 This front view of stacking the books were easy for my little boy to reach and see what books he wanted me to read. I cut out and painted 5 ft giraffe's front and back to mount to sides of card unit. My inspiration for giraffe was from a coloring book and I love the giraffe's expression, he is so sweet. 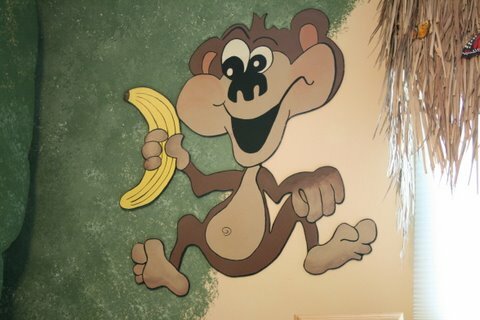 Had fun cutting out of luan and painting this sweet guy, expression says it all. 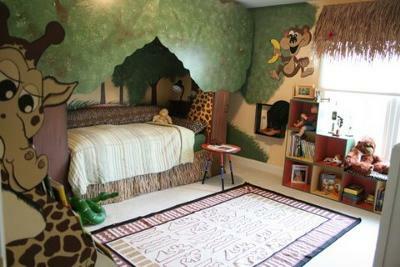 I love everything you have done to your son's bedroom! my favorite is the giraffe and thatch! Thank you for all your kind comments, I love this room and hate to part with it, currently trying to sell so it will be heartbreaking to see it go. In order to create the thatched valance, it was 6 feet long so a 1/2 inch plywood valance was created by my husband cutting length of window and angled pieces at sides to anchor with 1x2's bolted to secure. Angle is about 50 degrees, personal preference. I purchased thatching at a supply store in Nashville and cut to size over front and sides. I nailed/screwed and hot glued on to secure. It would even be perfect for creating a canopy over queen bed since it is 6 feet long. Thanks for asking, it was fun to create. Thatch Valance - How did you do it?? Could you provide more info on how the valance was constructed? I absolutely love this idea and want to incorporate it into my daughter's room, but I'm not sure how exactly to build the wooden valance. Is it just a straight wooden valance or does part of it slant out to put the thatch on it? 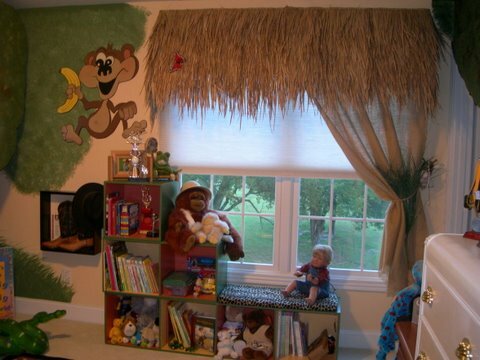 Awesome jungle room. My grandson had the Zanzabar bedding, this would be a cute transformation for him also. Great artwork, lucky little guy! I love it ! It's absolutely amazingly creative. I see lots of LOVE put into doing it. The child is so privileged.